Thanks to our wonderful Colorado Gives Day media sponsors, our statewide movement is receiving nearly $500,000 in donated print, online, on-air, bus board and billboard media support. These powerful partnerships help us spread the word about Colorado Gives Day. We are pleased to welcome a new sponsor this year, Outdoor Promotions of Colorado, which is sharing the Colorado Gives Day message on 20 bus stop shelters located around the Denver metro area. 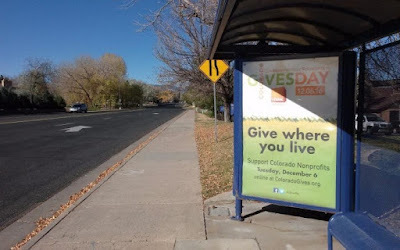 Keep an eye out for Colorado Gives Day banners at bus shelters like this one in Arvada!